Do you think about taking care of your clothes? I’m not sure about you, but beyond the basics and following the instructions on the clothing label, I didn’t really think much else about laundry or keeping my clothes looking new. Use these tips to protect your clothes in the washing machines and get soft & fresh laundry every time. Do You REALLY Need to Wash? Not every item you wear needs to be washed after every wear. Reducing the number of times your clothes goes through the washing machines can help keep the new clothes look for longer. Undergarments should be washed daily. Wash items like pants or towels every 3 or 4 days. Jeans can be washed even less often – up to every 6 months! We all know we’re supposed to sort the whites from the colors. But every so often, that ONE color item gets in with the whites and instantly all your whites are looking gray, dingy, or even pink. An easy way to keep the clothes separated is to have multiple laundry baskets – one for colors and one for whites. We also have a third basket that is used for towels and heavier clothing items. As clothes are tumbled and tossed as they’re being washed, they can pull, stretch out and rub together. This leads to faded colors, pilings and fuzz on towels that can make clothes look old and worn. Downy Fabric Conditioner protects your clothes from friction in the wash to help them look newer for longer. 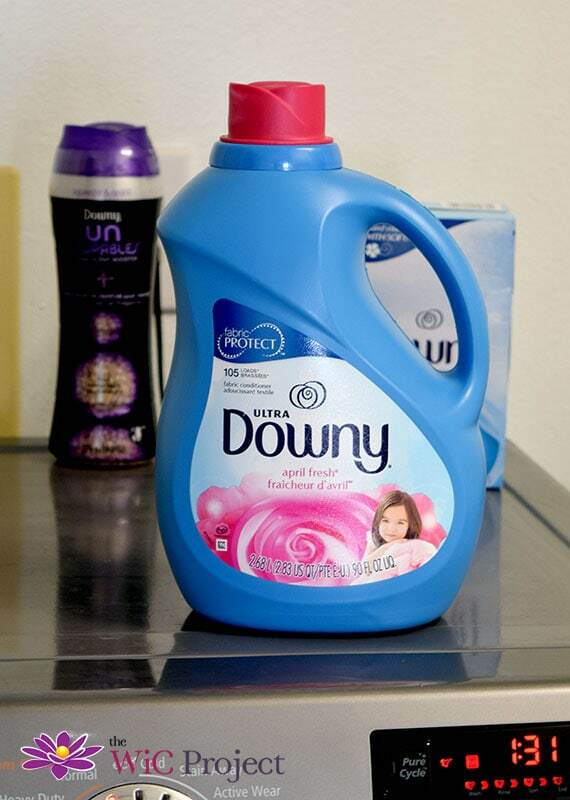 Adding Downy Fabric Conditioner to your wash also makes clothes smell amazingly fresh and helps reduce wrinkles. I was so impressed by the difference. We already use Tide with a Touch of Downy, and the addition of the Ultra Downy Fabric Conditioner made the t-shirts, towels, and even jeans noticeably softer. The towels seemed extra fluffy too. I love the fresh scent the Downy Fabric Conditioner adds to the load without being too strong or perfume-y. It’s happened to me more than I’d like to admit, but one of the worst things you can do if you want soft and fresh laundry is to let wet clothes sit in the washing machine. Mildew quickly starts growing and all of a sudden your freshly washed clothes now smell like a dark basement. Set a timer or put the empty laundry basket in an obvious place as a reminder. Accidentally leave the laundry in the washer? 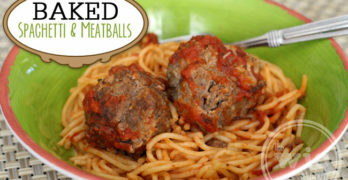 Add a cup of vinegar or baking soda and run another wash cycle to combat the smell. 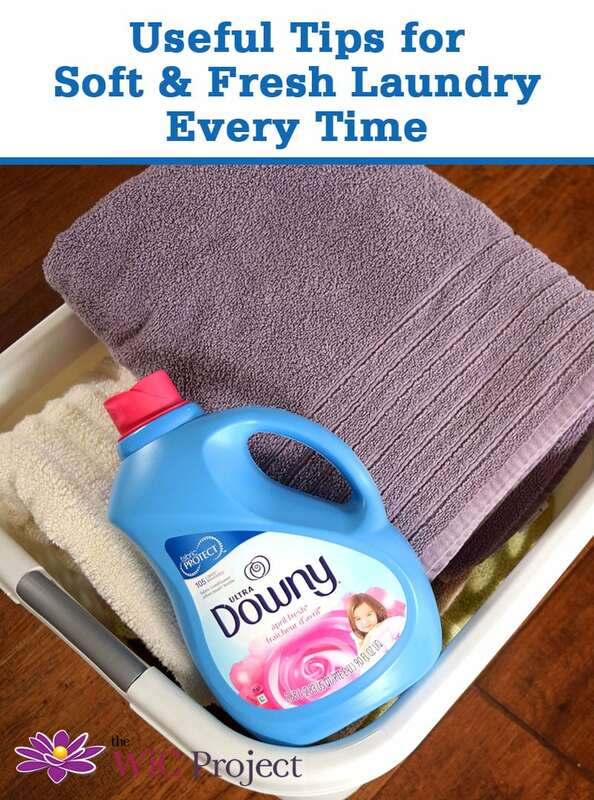 If you’re ready to protect your clothes and get soft, fresh laundry every time, Downy Fabric Conditioner is available at Walmart and Walmart.com for everyday low prices. Do you have any helpful laundry tips and tricks? Leave them in the comments below! I know a lot of people use Laundromats in bigger cities because they do not have a washer and dryer in their place. I know that was how it was for me. I wished I would have used more fabric softener when I was doing laundry because it seems like it would have made my clothes last longer.